Take him away! Photo by the Presidencia. In a curt two-sentence announcement by the Supreme Court, the magistrates announced that in a December 16 session the court, via a decision written by suplente Gisela Agurto, found that Ricardo Martinelli’s habeas corpus motion to challenge a request for “a measure to restrict bodily freedom” aimed at the former president was “not viable.” The court will meet again in plenary session on Monday, December 21 to consider magistrate and acting judge Harry Díaz’s request for such a measure — an arrest warrant. 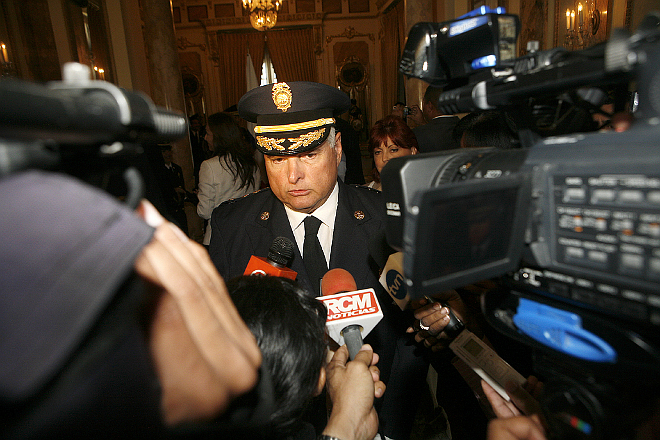 Martinelli is in self-imposed exile in Miami, so any attempt to take him into custody would have to pass through INTERPOL and US legal or political systems. The process could be blocked in the United State or stall there for years, or could unfold with blinding speed, if a warrant is issued. In the December 21 hearing the court, having dispensed with months of assertions of immunity and procedural motions, is expected to rule on whether the underlying evidence and law justify the arrest of Ricardo Martinelli for an electronic eavesdropping program that followed at least 150 people. The equipment that was used and the two men who operated it have been missing for more than one year. However, computer files and the testimony of multiple witnesses indicate that this spying did happen and that it was done at Martinelli’s behest. The most damning piece of evidence is a file, which someone tried unsuccessfully to erase from a National Security Council computer, with surveillance reports on some 150 people. The ex-president’s operatives could and did remotely and surreptitiously turn on programs like Skype or telephone connections in people’s computers and mobile devices, converting them into bugs that could pick up nearby activities or conversations even when it appeared that the things were turned off. Some of the intercepted conversations were used to make crude political attack videos that the Martinelli regime circulated in collaboration with Google on YouTube.